The ongoing reconstruction of South Galvez Street will require a temporary detour on Martin Luther King Boulevard so contractors can perform exploratory work under the street, the city of New Orleans announced. The detour — which affects traffic on Martin Luther King Boulevard between South Rocheblave and South Prieur streets — began Monday and is expected to continue for at least a week, the city announced. The City of New Orleans construction contractor, Command Construction Industries, LLC, will temporarily detour the river and lake bound traffic on Martin Luther King, Jr. Boulevard between South Rocheblave and South Prieur streets beginning at 8 a.m. on Monday, Aug. 6, 2018. 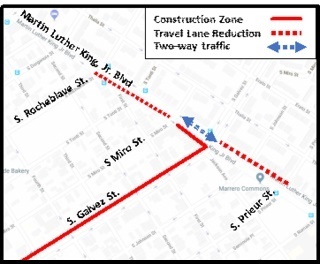 The detour and lane reduction are necessary to accommodate exploratory work on Martin Luther King, Jr. Boulevard as part of the South Galvez Street Reconstruction Project in Central City. The duration of the detour is projected to last about one week, but is subject to change pending the results of the exploratory work. Public safety is our top priority; residents and commuters are reminded to use caution when driving, bicycling and walking near this construction site. The temporary detour will allow construction crews to excavate the roadway at the intersection of Martin Luther King, Jr. Boulevard and South Galvez Street so that new underground utilities can be connected to existing utilities. River-bound traffic will be shifted to the traditionally lake bound side of Martin Luther King, Jr. Boulevard. A single lane of traffic will continue in both directions of Martin Luther King, Jr. Boulevard between South Rocheblave and South Prieur streets. Signage and traffic control measures such as barrels will be onsite to direct drivers and pedestrians. The $5.4 million reconstruction project calls for removing and replacing existing sewer, water and drainage lines, widening the neutral ground, reducing the width of the roadway, paving the travel lanes in concrete, paving the parking lanes in pervious (allows water to pass through) concrete to increase drainage capacity, installing new LED streetlights, as well as installing new sidewalks and Americans with Disabilities Act-compliant curb ramps at intersections.